LOCATION: 155 W. Commercial St. 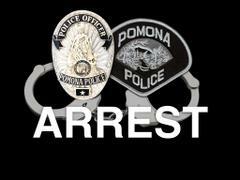 Earlier this morning at approximately 2:45 AM, the Pomona Police Department received several alarm activations from California Auto Supply. When officers arrived on scene, they observed a flashlight beam and movement from inside the business. Officers quickly set up a perimeter around the business. During this time, officers observed forced entry and numerous items from inside the business in the alley way. Shortly after setting up the perimeter, officers observed a suspect exiting the business from the rooftop. Officers were able to take the suspect into custody without incident. Officers searched the business and the immediate area for additional suspects, but were unable to locate anyone. Officers were able to recover property taken from inside the business and arrest the suspect for 459 PC- Commercial Burglary.